BOULDER — Matthew Jansen will open a new restaurant, Raglin Market, on Dec. 7 at 5378 Gunbarrel Center Court Unit 2 in Boulder. 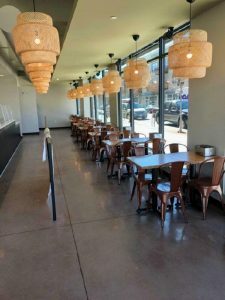 Jansen, who also operates Mateo at 1837 Pearl St. in Boulder, said the new restaurant will be a “fresh casual” concept featuring soups, salads and sandwiches that highlight local, seasonal produce. The menu is influenced by Mateo’s Provençal cuisine, and includes highlights such as tuna niçoise salad; steak caesar salad; and a garlic shrimp sandwich. Raglin Market will open in the Gunbarrel area of Boulder on Friday. Courtesy Raglin Market. Italian winemaker and friend of Jansen, Giorgio Rivetti of La Spinetta in Piedmont, Italy, is creating a series of custom Raglin-labeled wines, which will appear on the menu in the coming months. The beverage menu also includes house-made cocktails; organic soft drinks from Tractor Beverage Co; local beverages such as Boxcar Cold Brew, Mortal Kombucha, and Iced Bhakti Chai; and local beer favorites such as Avery IPA and Upslope Craft Lager. The 40-seat restaurant will provide counter service as well as a dining room. The facility will grow to include an additional 40 patio seats when weather permits. Jansen plans a second Raglin Market location in Denver’s Five Points neighborhood later this year. The Gunbarrel restaurant will be open 11 a.m. until 8 p.m. daily. Entrees will be priced at $10 to $13, soups $6 and sides $3.